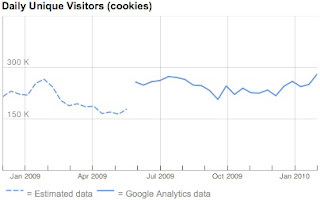 and on replacing traffic estimates with direct measured Google Analytics data. This latest upgrade improves the accuracy of our estimates by over 10%. We look at a large amount of data and metrics to evaluate our estimates and are continuously working on improving them. We believe our model to be among the more accurate sources of traffic estimation in the industry. Publishers who would like to complement their site listing with direct measured data are welcome to do so by opt-ing in their Google Analytics data in DoubleClick Ad Planner Publisher Center. We invite publishers who are new to Ad Planner to learn more about using Publisher Center to manage their site profile. In the coming months, we plan to bring direct measured site traffic data to country-level profile views in addition to the worldwide profile views that are currently supported. To offer additional transparency into how Ad Planner generates its data, we've published a new help document about our methodology. The document provides more details behind how Ad Planner generates site traffic data, in addition to other data, such as demographics, ad information, categories and descriptions. Give DoubleClick Ad Planner a try at www.google.com/adplanner. We think you'll find it to be a powerful research and media planning tool that makes it easy to find audiences and create well-informed media plans. The mission of DoubleClick Ad Planner, Google's free research and media planning tool formerly named Google Ad Planner, is to provide the deepest, most accurate insight into online audiences possible. This insight helps display advertisers select the best sites for their media plans and drive results for their campaigns. One of the many data points that DoubleClick Ad Planner provides is site traffic data. In line with Ad Planner's mission, we've improved how we estimate and share this data in order to provide media planners, buyers and researchers with improved data quality and more data visualization options. This builds upon the traffic improvements we made in January of 2009 and is part of our continuous effort to provide trusted insights into online audiences. To improve the quality of our site traffic estimates, we have upgraded our traffic estimation model. Our model uses a hybrid methodology that combines sample user data, from various Google products and services, with direct measured site-centric data. The model's direct measured signal is pulled from Google Analytics customer accounts that have chosen to opt-in to sharing their data with Ad Planner. This hybrid approach allows us to use direct measured data to train our traffic estimation models and produce the best estimate for any given site. For more information about how we use opt-in Google Analytics data check out our past blog posts on how Google Analytics data is used in Ad Planner and on replacing traffic estimates with direct measured Google Analytics data.